The U. S. Episcopal Church has, since its formation, produced a translation of its liturgy, the Book of Common Prayer, into French. Nowadays this version is largely for use outside the United States, but that was clearly not the case originally. These early versions appears to have been produced for use in French-speaking (Francophone) congregations within the U. S. I am aware of such congregations in New York and in Louisiana, and there may have been others elsewhere. The edition used here of the 1789 Book of Common Prayer in French was published in New York in 1846, and is stated to be a "new edition, revised and corrected", as one can see from the picture at left. It contains the entire Book of Common Prayer, less the Ordinal, but additionally including "Les Psaumes de David, mis en Vers Français". It is listed in David Griffiths' Bibliography of the Book of Common Prayer as 36:61. 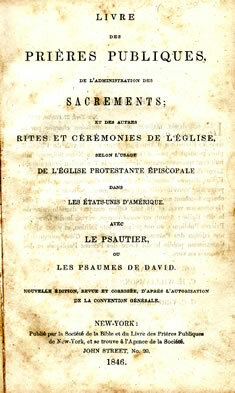 Other French editions had been previously published in 1803 and 1831. The 1803 edition was actually the C of E (1662) French translation adapted for American use, and not a translation of the American BCP. 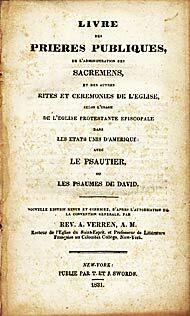 The 1831 translation is online from the Internet Archive, and a later 1860 translation is from from Google Books. My knowledge of the history of these French editions of the BCP, and of French-speaking congregations in the Episcopal Church is quite lacking; if any have additional information I'd be pleased to hear it. The history of one of them, Saint-Esprit in New York, is available online; this parish provided the translators of the two French BCP's which preceeded this one. As I am not well-versed in French, I would, as usual, appreciate any and all corrections and comments. Table of Lessons of Holy Scripture to be read at Morning and Evening Prayer throughout the Year. Tables and Rules for the Moveable and Immoveable Feasts, together with the Days of Fasting and Abstinence throughout the Year. Tables for finding the Holydays. The Order for Daily Morning Prayer. The Order for Daily Evening Prayer. Prayers and Thanksgivings upon several Occasions, to be used before the two final Prayers of Morning and Evening Service. The Collects Epistles, aud Gospels, to be used throughout the Year. The Order for the Administration of the Lord’s Supper or Holy Communion. The Ministration of Public Baptism of Infants, to be used in the Church. The Ministration of Private Baptism of Children, in Houses. The Ministration of Baptism to such as are of Riper Years, and able to answer for themselves. A Catechism; that is to say an Instruction to he learned by every Person before he be brought to be confirmed by the Bishop. The Order of Confirmation, or Laying on of Hands upon those that are baptized, and come to years of Discretion. The Thanksgiving of Women after Child-birth, commonly called, The Churching of Women. A Form of Prayer for the Visitation of Prisoners. A Form of Prayer and Thanksgiving to Almighty God, for the Fruits of the earth, and all the other Blessings of his merciful Providence. Forms of Prayer to he used in Families. Selections of Psalms, to he used instead of the Psalms for the Day, at the discretion of the Minister. The Psalter, or Psalms of David.